Parties and holidays would be so boring without a sharp knife for slicing through meat. And if you have the manual knife that requires sharpening every few uses, you just can’t do without the Black Decker EK-700. An electrical knife with excellent construction, the Black Decker complies with the USA electrical standards. Additionally, this knife boasts a safety lock feature that protects the user from accidental starts and hazards. It is definitely ideal for every user, even those who have gripping issues due to arthritis. 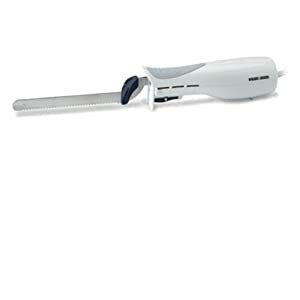 If you have always carved turkey, chicken, beef or pork during parties, get yourself this powerful knife. Often known as a tools company, Black and Decker are able to produce kitchen equipment to a very high standard. A modern knife with a sleek, contoured design, the Black and Decker EK-700 boasts stainless steel blades. Stainless steel, as you might know, is dishwasher safe and long-lasting. In case you fear causing an accident to yourself when you least expect it, this item has a safety lock. The lock will unlock when you want to start it and use the knife. While it is ideal for cutting through all sorts of food items, it will be best not to use it on frozen products as they will damage the blades. Once using the knife, it will slice though meat and bread with ease. Cutting French bread was the tester as so often an electric knife will crush this type of bread but the Black and Decker EK-700 slices through it without problems. The blade is sharp and even with regular use does not become blunt. It will take a lot to wear down this knife. It is easy to use and the blades fit in first time, meaning there is no time wasted fussing around trying to get the knife ready for use. It is possible to depress the cutting trigger and keep it this way meaning that for someone without a lot of strength it can be used for longer periods of time without pain. There are crafters who need knives to cut through foam and there are reports that this knife is ideal for this. It makes a straight and steady cut and does not tear the foam. Due to the blades fitting well together and there being just a slight gap between them, nothing is able to get in them, so everything that is cut ends up on the plate. It has a cord of around 5 feet in length so there is the chance to be a little away from the socket when using. Cons: there is not a case, can be heavy to hold. Bottom Line: an inexpensive knife that works on meats and craft items, and is safe to use.